Please don’t stick a fork in me yet, though. 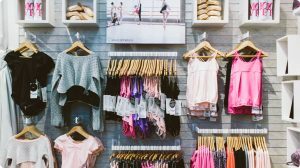 In celebration of one of my favourite months of the year, a recent two year blogging milestone here at Femme Fitale, and embracing all the changes that lie ahead for my family this year, I’ve teamed up yet again with my amazing friends at Fitness First for an exciting giveaway! Once again, I apologize to my wonderful international readers…this one is for the Aussies. That’s right! 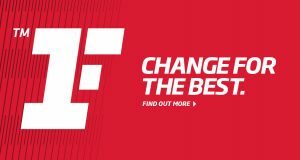 After Fitness First and their members have embraced change in 2014 with a complete overhaul of their gyms and programs as part of the #changeforthebest campaign, they are now helping me to Pay It Forward to my people: you guys! I was thinking about (just some of) the things that keep me motivated when I am feeling unambitious and unmotivated in health and fitness. Skimming through Instagram or my blog roll to see some of the healthy meals featured by some of my favourite bloggers, friends and companies. Dragging myself to the gym even I really don’t feel like it. The energy from the people and music in a group fitness class like Body Attack or Pump is always enough to reinvigorate me. Adam! He leaves the house every day at 5am just so he can go to the gym before work, despite the fact that his days are usually quite long and stressful. If he can stay on track, so can I! Thomas! Whenever I feel like eating a bowl of cereal for dinner, I know that is not a viable option for my boy…so I always end up eating a balanced dinner because of him (and now a new, growing baby in my belly). 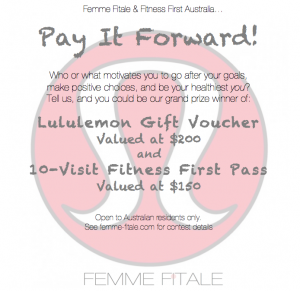 A $200 Gift Voucher to Lululemon and a 10-Visit Pass to Fitness First! Ummm…I seriously wish this prize was mine! Be certain that you include your name and email address. Your email address will not be published. Femme Fitale Facebook page.Make sure you follow steps 1 and 2 in order to fully qualify to win! 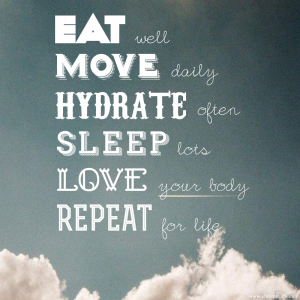 Although we are almost 1/2 way through 2014, it’s certainly not too late to make this year your healthiest and happiest yet. Good luck! Competition is open to Australian Residents and closes on Saturday, June 21st, 2014 at 11:59 PM AEST. 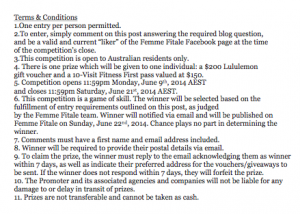 The best, valid entry will be chosen as the winner by the Femme Fitale team and the winner will be announced on Sunday, June 22nd, 2014 on femme-fitale.com. Winner will also be notified by email.